As you may know, in addition to being a blog about beverages, A Thirsty Spirit has occasional posts on how to get rich, like this one from last spring, focusing on an ill-conceived plan for the pursuit of tycoon-ship through winery ownership. Well, here’s another. According to a recent study published in Bloomberg today, wealthier Americans are more likely to binge drink than their not-so-wealthy neighbors. Ergo, binge drinking must make you rich. The study also shows that (surprisingly) binge drinking is more common with 18-24 year olds. Sounds like it keeps you young, too! Finger Lakes Distilling got a great mention in an article in today’s dining section titled, “Just Don’t Call it Moonshine“. The McKenzie Bourbon and FLD Cherry Liqueur were also used to cap off the evening at last night’s Finger Lakes Christmas at The James Beard House. Oh, what a year it has been. Happy Holidays, everyone! Bring your own bottle and pick your poison - white, red or pink. 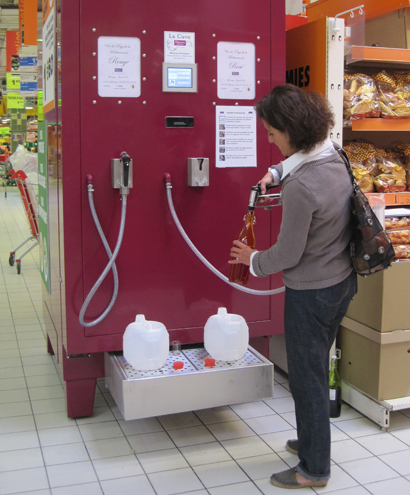 Astrid Terzian came up with the idea, installing her first machine in Dunkirk in June 2009, and has since followed up with 9 machines across France. The wines tend to cost around $2 per liter! I’ve had great luck filling up bottles out of casks at mom and pop joints in Spain and in Italy and I hope Dr. Vino is correct when he anticipates we’ll see something like this in the U.S. within a year.